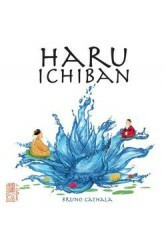 In Haru Ichiban, or "The Wind of Spring", two apprentice gardeners compete to use this wind to their advantage to create harmonious patterns of their blossoms upon the lilypads. Each gardener has eight flower buds numbered 1-8, with three of those buds being in hand at the start of a round. Sixteen lilypads are placed in the 5x5 pond, with one of them turned to its dark side. Each gardener simultaneously chooses a reveals a bud, with the player with the lower number becoming the Little Gardener and the other becoming the Grand Gardener. In order: The Little Gardener places one of his colored blossoms on the dark lilypad. The Grand Gardener places one of his colored blossoms on the lilypad of his choice. The Little Gardener moves one lilypad to an adjacen..